Perched on the high hillsides of the rock of Vergisson, this place called "Sur La Roche" is a unique terroir that asserts itself by its high altitude and especially by a soil formed of extremely limestone white stones. Considered one of the best parcels of Pouilly-Fuissé, it allows to give concentration, color and matter while allowing the wine to maintain nervousness. This is particularly the case here with old vines over 50 years old. The vinification and aging in oak barrels are examples of rigor, precision and patience, to bring matter and aromatic complements without denaturing the wine. The aging lasts 12 months with 15% new oak. 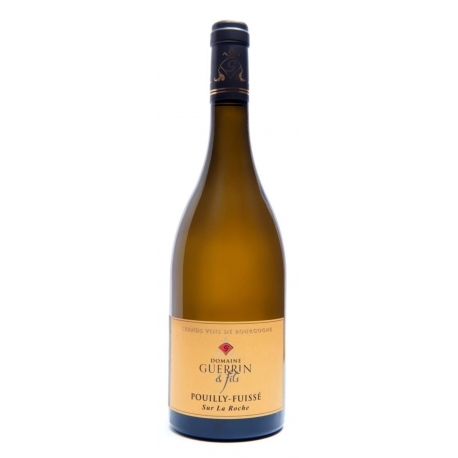 This Pouilly Fuissé is a wine of character, very pure, fine and with a very nice minerality. It will express on the nose a complex bouquet of fruits: fresh lemon, exotic fruits, peach ... On the palate a frank attack that quickly gives way to a beautiful roundness and especially an incredible aromatic concentration. The finish is supple and elegant, the length in the mouth remarkable. Fabien Guerrin has been with his parents for 5 years and gradually takes over the estate, located on the heights of Vergisson in southern Burgundy, in the Mâconnais wine region. Between the rocks of Solutré and Vergisson, the Guerrin family estate is constantly on the lookout for finesse, purity and balance in its great white Burgundy wines. Very attached to a traditional viticulture, mainly manual, and respectful of the environment. To note among the qualities in the behavior of the wine-making property: plowing of the grounds, which allows the roots to go down in depth, controlled yields and a manual thinning make it possible to offer the Chardonnay ideal conditions of maturity. Manual grape harvests associated with a slow and natural vinification, carried out thanks to the yeasts naturally present in the grapes, allow to keep the soul and the authenticity of the terroir of each wine. The aging is done on lees in oak barrels and lasts from 11 to 12 months depending on the vintage and the typicality of the terroir. Elegant and full of charm, this white wine has a colour ranging from pale to deep gold, flecked with green. Different families of aromas make up the bouquet: mineral notes (silex), almond and hazelnut, citrus notes (lemon, grapefruit, and pineapple), white fruits (peaches), bracken, acacia, breadcrumbs, buttered brioche, and honey. In the mouth it is possible to discern the differences between wines from different plots. The texture is opulent, and the structure, thanks partly to the wine’s natural richness, is full of flavour. It is by nature delicate and distinguished. This wine is not to be confused with the Pouilly-Fumé, which comes from the banks of the Loire River. White: straightforward, rich and complex, it has a characteristic hint of minerality which allows it to partner noble crustaceans (king prawns, lobster, crawfish) as well as foie gras. With acidity and smoothness sonicely in balance, it goes well with white meats such as veal or poultry in cream sauce, as well as many varieties of goat’s cheese. Its aromatic power means it can also match spicy and perfumed exotic dishes such as couscous, fish tajines, or sweet-and-sour prawns. Sushi is also enhanced by its minerality. The rocky outcrops of Solutré and Vergisson, emblematic of these vineyards, remind us that from a height of 500 metres, 200 million years of history is looking down on us! Indeed, 20,000 years ago one of the most fully evolved prehistoric cultures flourished here. This AOC, instituted in 1936, takes in the four villages of Solutré-Pouilly, Fuissé, Vergisson and Chaintré. Lying on a foundation of fossiliferous limestone identical to those found further north in the Côte-d’Or, the Bajocien escarpments of Solutré and Vergisson owe their dramatic profile to the presence of hard fossil corals which have resisted erosion. The vines are planted on the slopes and at the foot of these two hills on clay-limestone soils of Jurassic origin mixed with scree from up-slope and, in one spot, schist. The hillsides are cut into by little steep-sided streams which give the slopes an easterly or south-easterly exposure. Altitudes: 200 to 300 metres.